While publicity in the West concentrated on the summit between the North Korean leader and the US president, the reality is that Trump has been forced into the talks by the efforts of Kim Jong-Un and Moon Jae-In, the Korean leaders for the North and South. Initially Trump called the South Korean president, ‘appeaser’. Originally there were talks between Korean leaders in 2000 and 2007. The talks in 2000 resulted in a joint declaration and resolution of military issues. In 2007 there was active promotion of economic cooperation and meetings to resolve nuclear issues but the US did not fulfil its commitments so that North Korea had to rely on its own efforts to ensure its security. Its success in developing nuclear weapons and means of delivery has given the lie to the caricature of a backward prison state and won the people in the whole of Korea over to a renewed ambition for peace and unity. Momentum for peace talks increased with the election of Moon Jae-In in South Korea on a platform of working for peace with North Korea and to develop cooperation and ultimately re-unification. The North Koreans took advantage of the winter Olympics and sent a large delegation of sports people and several high level diplomats to the games. A top level meeting between the leaders was arranged. 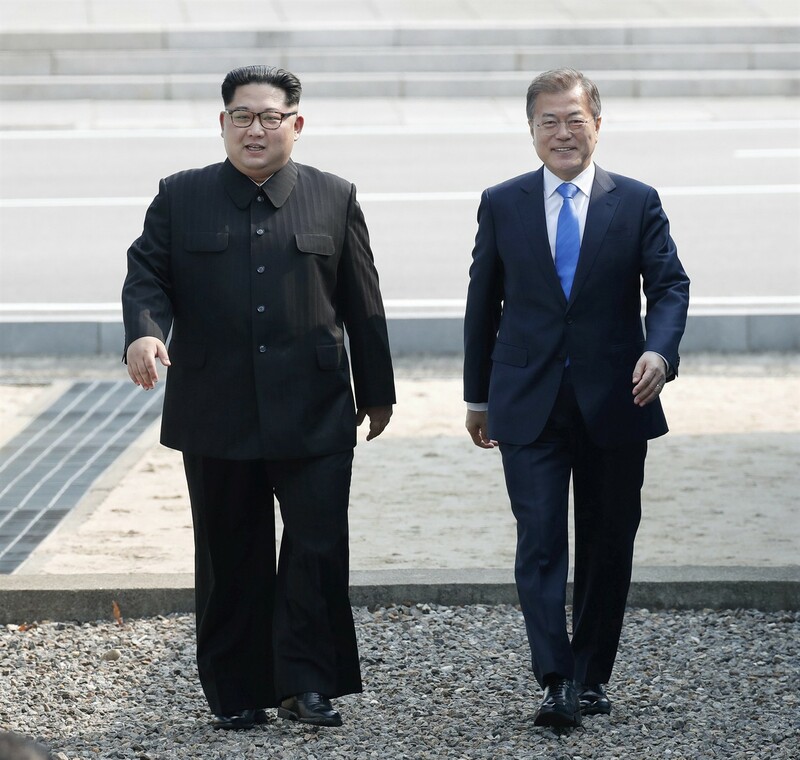 The friendly summit between Kim Jong-Un and Moon Jae-In resulted in the ‘Panmunjom Declaration’ for peace, prosperity and re-unification. It officially ended the 1950 to 1953 war between North and South Korea, which until then had the status of an armistice. After the defeat of Japan in the 2nd World War the Soviet Union administered the North while the US did so in the South. On their withdrawal the Korean leadership through its army sought to re-unify Korea by defeating the army controlled by the right wing and pushed to a small corner in the South West. At this point the US invaded the country to save the rightwing leaders and their army. Then, taking advantage of a temporary absence of the USSR from the United Nations it got approval for invasion by its allies under a UN flag. Britain sent 100,000 troops to Korea and suffered 4,502 service personnel killed or injured. The US army was led by General McArthur who wanted to invade China, just liberated from the Japanese and the rightwing army led by Chiang Kai-shek in a struggle led by Mao Tse-Tung and the Chinese Communist party. When the US army reached the border, the People’s Liberation Army (PLA) counter attacked, pushing the armies of the US and its allies back to the original partition line. After months of stalemate an armistice was reached. China withdrew the PLA but the US has kept troops in South Korea ever since. The incentives for peace for both governments and people in Korea are great. US adventurism and war would result in huge casualties and damage in the whole of Korea. During the war 3 million Koreans, 10% of the population died. China too has a large stake in peace and is one of the armistice signatories. The US troops and bases in South Korea, which are mainly used by the US as a threat to China, are paid for by South Korea so the benefits of a full peace treaty to Koreans and their neighbours would be great. At present the security of Koreans is protected by their nuclear weapons and delivery systems and a very strong military in North Korea. They have learned from US actions in Libya that the US does not reliably comply with agreements. Similarly, the US failure to supply a light-water nuclear reactor led North Korea to resume work on nuclear development. A higher level of peace and cooperation in Korea will be complex to achieve and will need great support and perseverance by Koreans and their governments and their neighbours. They and world peace demand our support too.